While knife makers could debate at length about the benefits and drawbacks of using different steel grades to forge blades, the reality is that most people don't really pay much attention to the grade of steel used to make a knife. They should, though. The grade of steel, as well as how it's made, determines everything from the blade's hardness and durability to its ability to take and hold a sharp edge and its corrosion resistance. If you spend any time in the kitchen or outdoors, you'll understand the value of having a strong knife blade that retains a sharp edge. The following summary explains some of the most commonly used steel grades grouped as non-stainless and stainless steels. While the obvious drawback of non-stainless carbon steel is that it rusts more readily than stainless steel, carbon steels can be differentially tempered to provide hardness and excellent, sharp edges. When properly heat-treated, non-stainless steels make strong, reliable knife blades, although they are more for outdoor use and are not recommended for kitchen or cutlery knives. D2: An air-hardened "semi-stainless" steel, D2 has a relatively high chromium content (12 percent), which makes it more stain resistant than other carbon steels. It has shown excellent wear resistance and edge retention and is tougher than most stainless steels, such as ATS-34, although less so than other non-stainless grades. A2: Air-hardened tool steel. Tougher than D2, but less wear resistant. This grade can be treated cryogenically to improve edge retention. Often used for combat knives. W-2: Benefiting from 0.2 percent vanadium content, W-2 holds an edge well and is reasonably tough. While W-1 is a fine grade steel, the addition of vanadium in W-2 increases its wear resistance and hardenability. 10-series (1095, 1084, 1070, 1060, 1050, etc. ): 10-series steels, particularly 1095, are often found in cutlery knives. Carbon generally decreases as numbers in the 10-series decrease, which results in less wear resistance but more toughness. 1095 steel, which contains 0.95 percent carbon and 0.4 percent manganese, is reasonably tough, easy to sharpen, affordable, and hones to an edge superior to most stainless steels. It is, however, susceptible to rust. O1: Excellent at taking and holding an edge and popular with forgers. O2 is another reliable high carbon steel. Not being stainless, it will rust if not oiled and protected. Properly heat treated, O1 and 1095-grade steels are seen as by many equal to any expensive stainless steel grades. Carbon V®: A steel designation trademarked by Cold Steel, Carbon V reportedly fits between a 1095 and O1 grade and is similar to 50100-B. Carbon V is a cutlery grade steel that shows reasonable corrosion resistance and good edge retention. It is exceptionally tough but harder to sharpen than most stainless steels. 50100-B (0170-6): Two designations for the same steel grade, this is a chrome-vanadium steel with strong edge taking and holding qualities. 5160: This medium-carbon, low-alloy steel grade is tough and hard. It is effectively spring steel with added chromium to increase hardenability. Tough and impact-resistant, these steels are most often found in axes and hatchets. CPM 10V: Crucible powder metallurgy (CPM) high vanadium-content steel. This grade provides excellent wear resistance and high toughness, but at a cost. Stainless steels are made corrosion resistant by the addition of chromium. 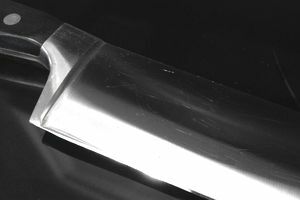 Cutlery-grade stainless generally contains more than 13 percent chromium, the oxide of which helps to form a passive film that protects against corrosion and staining. Most kitchen knives are made from martensitic stainless steel. 440A (and similar grades including 425M, 420HC, and 6A): High-carbon stainless steels, this grade of stainless can be hardened to a greater degree than 420-grade steel, allowing for greater strength and wear resistance. 440A is used in many production knives because of its edge retention, ease of resharpening, and corrosion resistance. 440C (and similar grades including Gin-1, ATS-55, 8A): Stronger than the 440A group of stainless steels as a result of a higher carbon content, 440C is a high-chromium stainless that has excellent hardness properties. Slightly less corrosion resistant than 440A, 440C is more widely used and is better regarded because it takes and holds a sharp edge, that is tougher and more stain resistant than ATS-34. 154CM (ATS-34): A widely used group of stainless steels. 154CM grade is the benchmark for high-end performance stainless. In general, this grade takes and holds an edge and is tough although it is not as stain resistant as the 400 grades. VG-10: Very similar to the ATS-34 and 154CM grades but with a higher vanadium content, this steel behaves equally as well but with more stain resistance and toughness. The additional vanadium also allows it to hold an excellent edge. S30V: A high chromium content stainless (14 percent) that contains molybdenum and vanadium, which enhances the toughness, corrosion resistance, and edge holding ability. However, the high degree of hardness makes this steel difficult to sharpen. S60V (CPM T440V) / S90V (CPM T420V): High vanadium content allows these two steel grades to be outstanding at holding an edge. The crucible powder metallurgy process used to produce these steel grades allow for more alloying elements than other grades, which results in greater wear resistance and toughness. S90V has less chromium and double the vanadium of its counterpart, allowing it to more wear resistant and tougher. 12C27: A Swedish made stainless, 12C27 is composed of an alloy similar to 440A. This grade of steel provides a balance between edge retention, corrosion -resistance, and sharpenability. It reportedly performs very well with properly heat treated. AUS-6 / AUS-8 / AUS-10 (also 6A / 8A / 10A): These grades of Japanese stainless are comparable to 440A (AUS-6), 440B (AUS-8), and 44C (AUS-10). AUS-6 is softer but tougher than ATS-34. It holds a good edge and is fairly easy to resharpen. AUS-8 is tougher but is still easy to sharpen and holds a good edge. AUS-10 has a similar carbon content to 440C, but less chromium, which results in less stain resistance. Unlike the 440 grades, however, all three AUS grades have vanadium alloyed to increase wear resistance and edge retention. ATS-34: A ubiquitous high-end stainless steel that became popular in the 1990s, ATS-34 is a high carbon and chromium stainless steel that contains molybdenum to increase hardness. This grade of stainless holds a good edge but can be difficult to sharpen because of its high hardness. ATS-34 has good corrosion resistance, though not as high as the 400 series steels. BG-42: This is a high-end, bearing grade stainless alloy made with a high carbon content. It contains manganese, molybdenum, and vanadium to improve hardness, toughness, and edge retention. Damascus Steel: Damascus steel refers to a process whereby two different steel grades are forge-welded together and acid etched to create steel with unique and eye-catching patterns. While Damascus steel is often made with importance placed on aesthetics, strong, functional and durable knives can result from the proper choice of steel and careful forging. Common grades used in the production of Damascus steel include 15N20 (L-6), O1, ASTM 203E, 1095, 1084, 5160, W-2, and 52100. Midway USA. Knife Steel & Handle Material Selection. Talmadge, Joe. Zknives.com. Knife Steel FAQ.